I think that 3 of the 5 lbs. I gained over the holidays were pockets of Buffalo Chicken Mac & Cheese dispersed all over my body. Yup. Definitely. It was our Clinton Christmas Party – on a Saturday night, which never happens – dress theme was “Shiny & Bright” – gift theme was “Naughty or Nice in the bedroom” (Mom if you’re reading this I got a lovely fleece blanket – swear to god) – food was a free for all, a delicious free for all, that included my dream meal – Buffalo Chicken Mac & Cheese. My friend Katie made it, and boy did she hit the nail on the head. After about three heaping plates full and two days of heartburn, I knew it was blog worthy. And only about a month later, here it is folks. 1) Preheat the oven to 350 degrees F and butter a 9-by-13-inch baking dish. Bring a large pot of salted water to a boil; add the pasta and cook until al dente, about 7 minutes. Drain. 2) Meanwhile, melt 3 tablespoons butter in a large skillet over medium heat. Add the onion and celery and cook until soft, about 5 minutes. Stir in the chicken and garlic and cook 2 minutes, then add 1/2 cup hot sauce and simmer until slightly thickened, about 1 more minute. 3) In a separate saucepan, melt 2 tablespoons butter over medium heat. Stir in the flour and mustard with a wooden spoon until smooth. Whisk in the half-and-half, then add the remaining 1/4 cup hot sauce and stir until thick, about 2 minutes. Whisk in the cheddar and pepper jack cheeses, then whisk in the sour cream until smooth. 4) In a large mixing bowl, add the cooked pasta, the onion/celery/garlic/chicken mixture and then the cheese mixture and mix together with a spatula. Place mixture in a greased 9″ x 13″ baking pan. 5) Put the remaining 4 tablespoons butter in a medium microwave-safe bowl and microwave until melted. Stir in the panko, blue cheese and parsley. 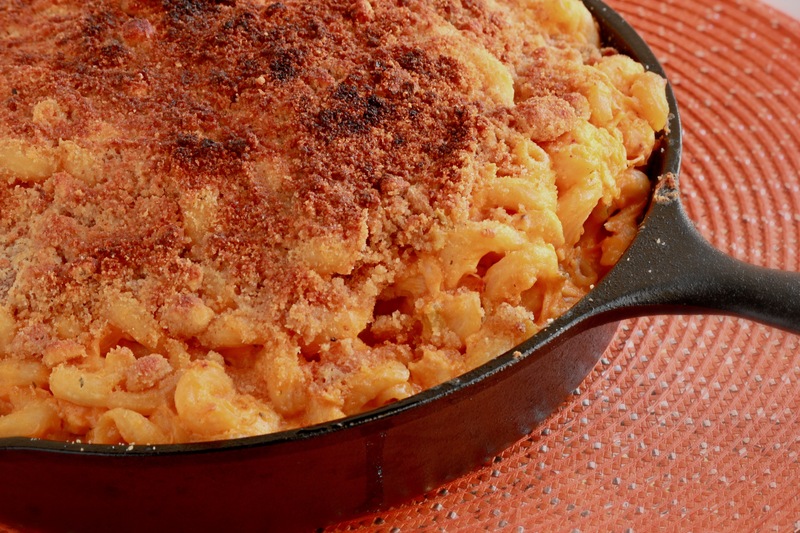 Sprinkle over the macaroni and bake until bubbly, 30 to 40 minutes. Let rest 10 minutes before serving. We’re baaaaack – boy what a week it’s been! 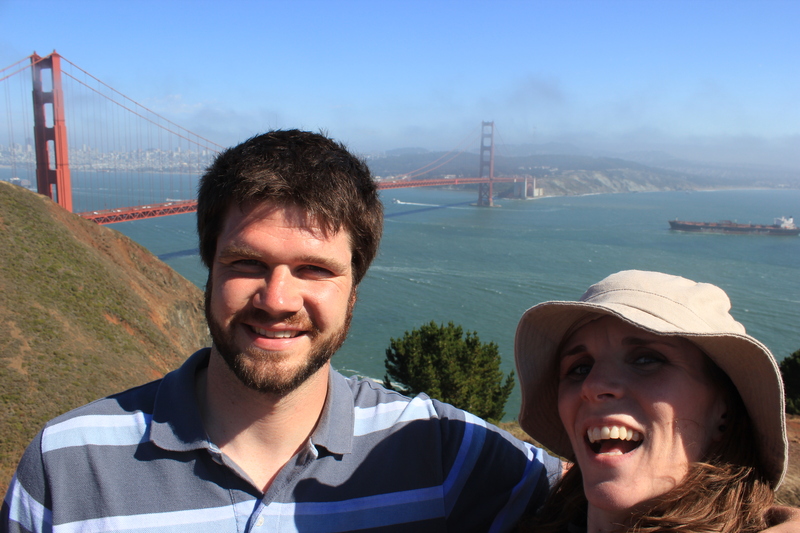 I feel like I’ve been to China and back (or maybe just the west coast) but in the last week, Dave and I flew to San Fran, drove to Sacramento, then drove to Lake Tahoe, then drove back to San Fran and then flew home! 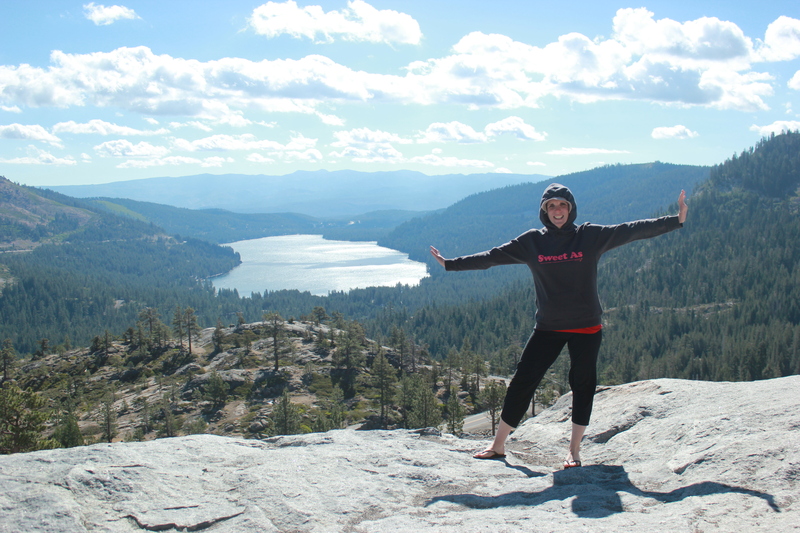 It was a whirlwind trip, but there were several things that made all the travel well worth it. 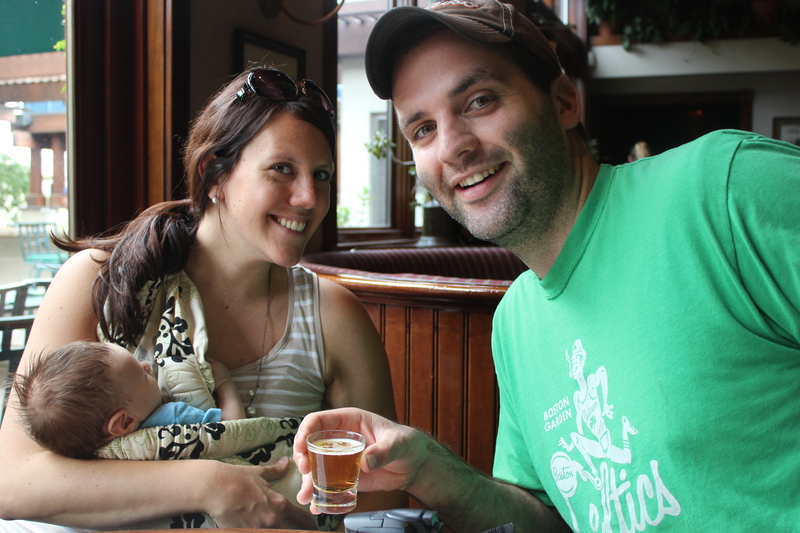 1) The Riehls and Little Joey – great hosts – who knew you could sample beer and parent at the same time? 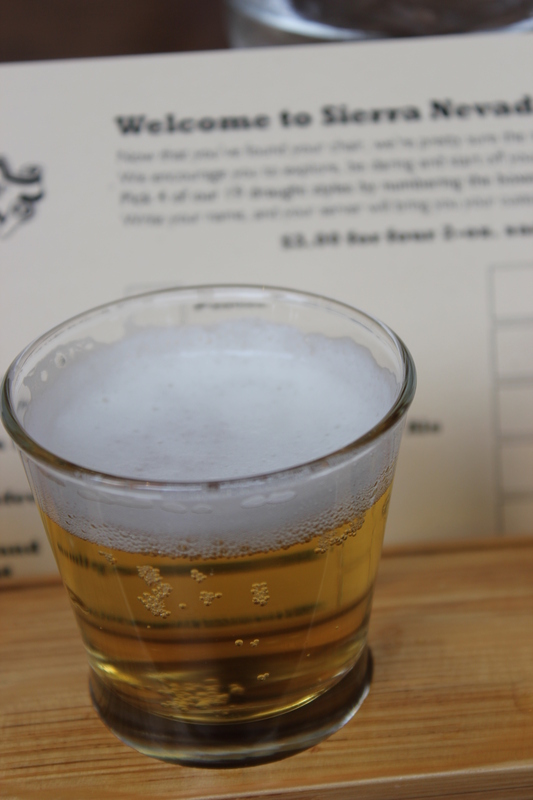 2) The Sierra Nevada Brewery – delicious food and even more delicious beer! 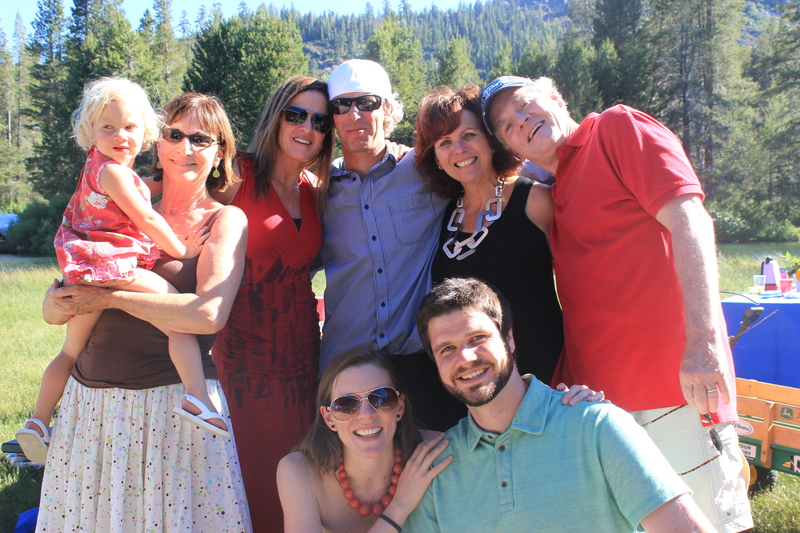 3) Lake Tahoe Wedding celebration for my step-sister Samantha and her husband Scott! Pictures could never do it justice – absolutely gorrrrrge! So we’re back to life, back to reality, back to cooking! This week, I thought it might be fun to do a series of recipes with one common ingredient, and this week’s ingredient ladies and gents isssss……(drum roll) GOAT CHEESE! I used to think “If it comes from a goat, I’m not eatin’ it” but now, goat cheese is one of my favorite cheeses – like a tangier cream cheese. And I’ve just come to realize how versatile an ingredient it really is. We got home from CA, and after picking up Hairy and spending lots of time playing with him to make sure he didn’t forget us, there was little time to grocery shop. So last night’s dinner was a ‘cabinet creation’. After not watering our herbs for almost a week, we were pleasantly surprised to find out that not only were they alive and well, but growing like weeds! Especially the basil! I had found this recipe from Prevention RD for Roasted Red Pepper and Goat Cheese pasta and thought “Yum” – and luckily, we had all the makings of it in our seemingly bare cabinets! Modified a smidgen, here’s part 1 of goat cheese week: Roasted Red Pepper, Goat Cheese and Basil Pasta, adapted from Prevention RD’s recipe. 2) Add the chopped roasted red pepper and tomatoes and simmer over low heat for about five minutes. 3) Add the goat cheese and stir until it’s completely melted into the sauce. 4) Take the sauce mixture and transfer to the food processor. Add the fresh basil, salt and pepper, and pulse until it becomes a sauce-like consistency. 5) Serve over cooked pasta! Usually, cabinet creations aren’t my favorite, but this particular time, I think we have a winner! 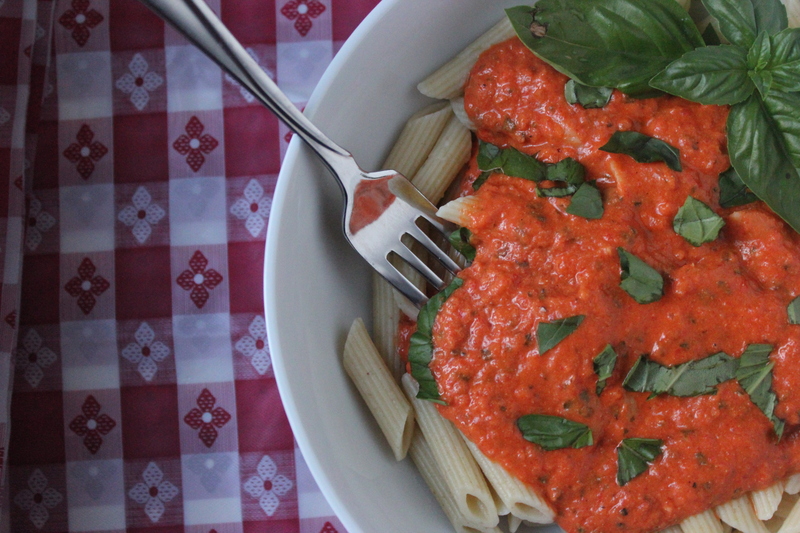 This sauce was so easy to make and a complete departure from your run of the mill tomato sauce. The goat cheese added a rich and creamy texture and the roasted red peppers a bit of sweetness. So good. And as I was stuffing my face, I started thinking of all the things you could do with it! You could serve it as a hot dip, with sliced baguette and veggies, or even use it as the base for a pizza (although Dave thinks it would be too watery on a pizza – one more challenge I’ll be happy to take him up on) But all in all, a definite keeper! Stay tuned for more delicious goat cheese installments this week! Warning – this recipe is not for the faint of garlic heart – it calls for NINE garlic cloves! Holy mother – so maybe not your best option for a first cooking-of-the-dinner for a new bf/gf, or the best dish to eat if you have anyone important to talk to in oh, say the next week or so. But I will vouch for this recipe and say it was delicious – I was nervous about the amount of garlic honestly, because even I being a garlic lover shuddered at the thought of using that much of it, but honestly, the other flavors balanced it right out. And the smell OHHH the smell! I love the smell of garlic cooking! It’s one of those smells that turn me into zombie mode whenever I smell it – I could be taking a jog or a walk, and that heavenly smell fills my nostrils and then you may as well consider me an extra for The Walking Dead, only instead of being on a quest for the flesh of humans, I am on a quest for garlic. This recipe is from Americas Test Kitchen. It’s funny, my mom bought Dave and I this cookbook a few years ago, and it has become more of a paper weight. But when our internet was acting up and I couldn’t find a recipe on the world wide web, I thought I’d go old-school. So I blew the dust off of this bad boy and let me tell you – they have some amazing looking recipes! I’m looking forward to trying many more! 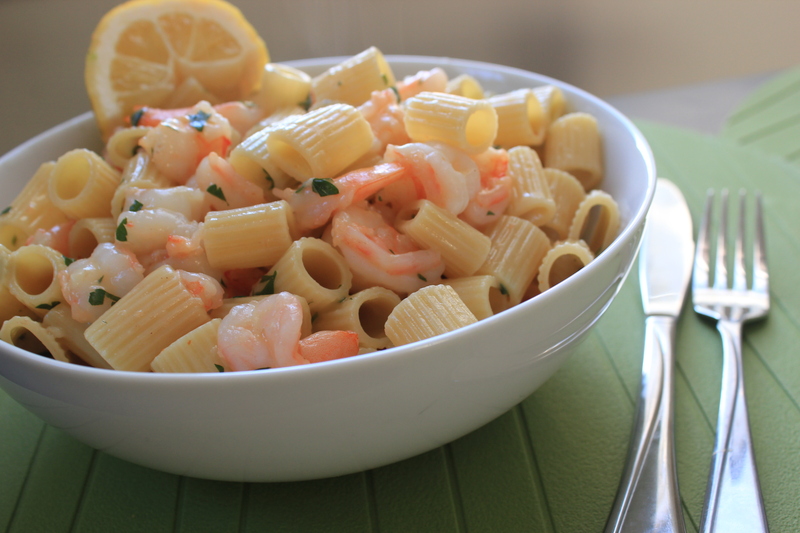 But this one was definitely a keeper – highly recommended for you shrimp, garlic and pasta lovers! Pretty simple ingredients, the only two that I really scratched my head at was the Vermouth and Clam Juice, since I’ve never used them before. 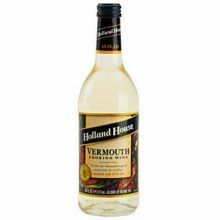 But Vermouth is a cooking wine you can find in the dressing aisle of the grocery store (or you can use the version you’d put in cocktails). 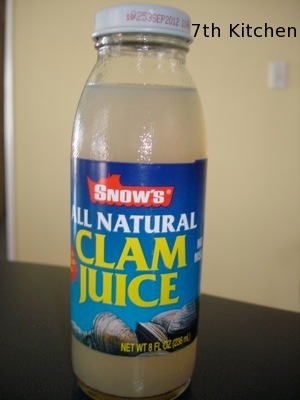 Or you could just use wine instead, and then you get to drink the rest of it 🙂 And the Clam Juice is in the same section with the tuna and canned seafood. And don’t be scared by the amount of steps – it seems like a lot, but they’re all very easy – promise! 1) Toss 2 teaspoons minced garlic, shrimp, 1 tablespoon oil, and 1/4 teaspoon salt in medium bowl. Let shrimp marinate at room temperature 20 minutes. 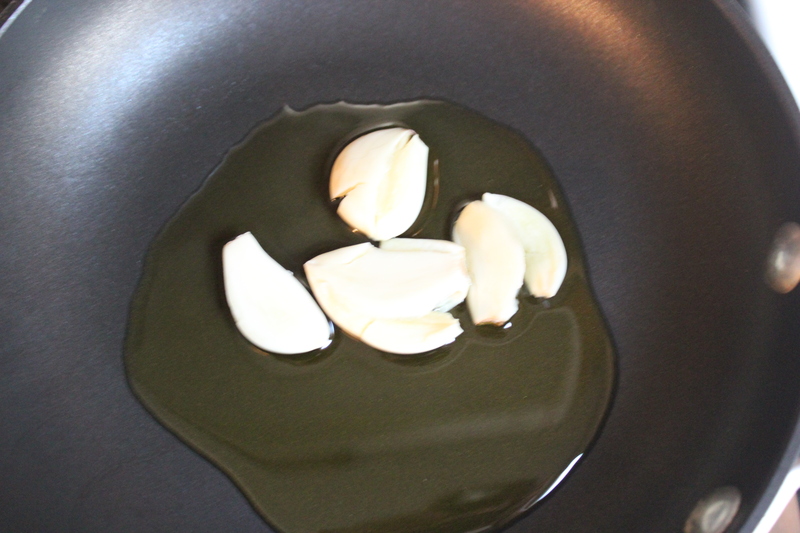 2) Heat 4 smashed garlic cloves and remaining 2 tablespoons oil in 12-inch skillet over medium-low heat, stirring occasionally, until garlic is light golden brown, 4 to 7 minutes. 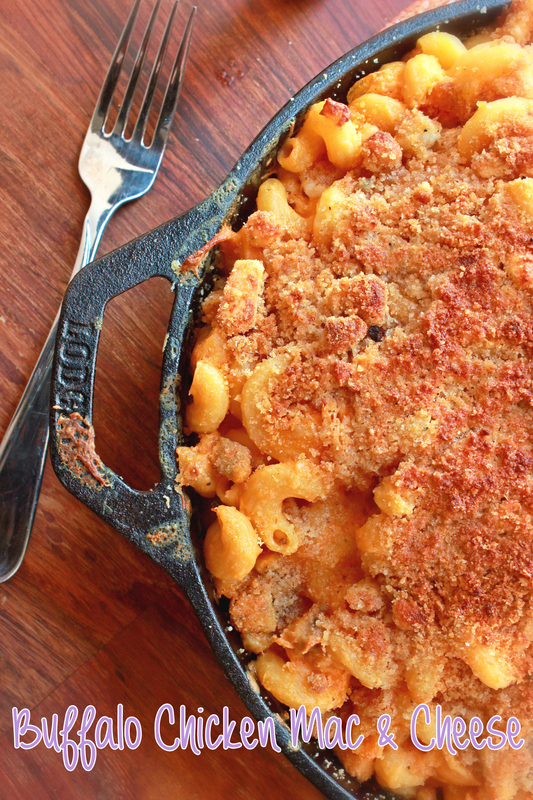 Remove skillet from heat and use slotted spoon to remove garlic from skillet; discard garlic. Set skillet aside. 3) Bring 4 quarts water to boil in large Dutch oven over high heat. Add 1 tablespoon salt and pasta. Cook until just al dente, then drain pasta, reserving 1/4 cup cooking water, and transfer pasta back to Dutch oven. 4) While pasta cooks, return skillet with oil to medium heat; add shrimp with marinade to skillet in single layer. Cook shrimp, undisturbed, until oil starts to bubble gently, 1 to 2 minutes. Stir shrimp and continue to cook until almost cooked through, about 1 minute longer. 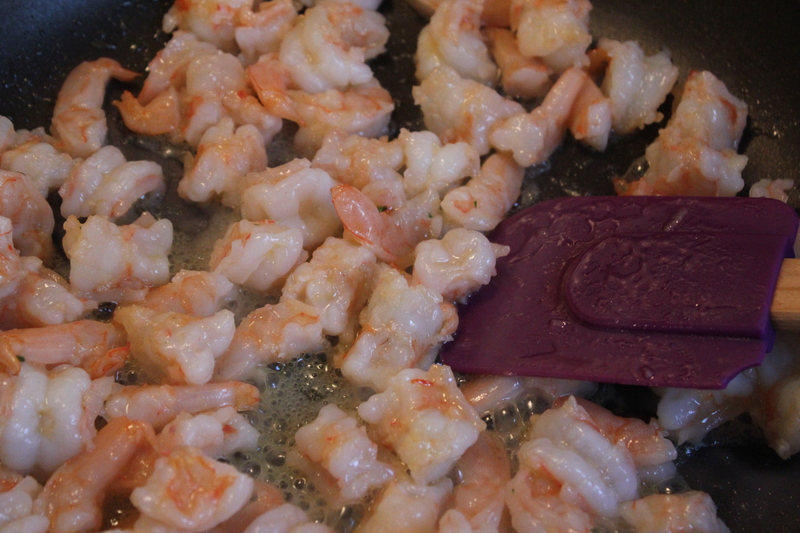 Using slotted spoon, transfer shrimp to medium bowl. 5) Add remaining 3 teaspoons minced garlic and pepper flakes to skillet and cook until fragrant, about 1 minute. 6) Add flour and cook, stirring constantly, for 1 minute; stir in vermouth and cook for 1 minute. 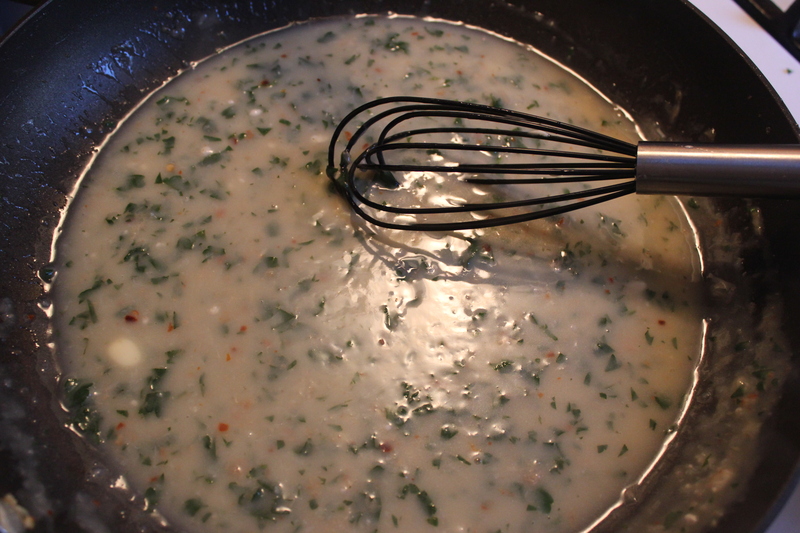 7) Add clam juice and parsley; cook until mixture starts to thicken, 1 to 2 minutes. 8) Take off heat and whisk in butter and lemon juice. 9) Add shrimp and sauce to pasta, adding reserved cooking water if sauce is too thick. Season with black pepper. Serve, passing lemon wedges separately. Yum! 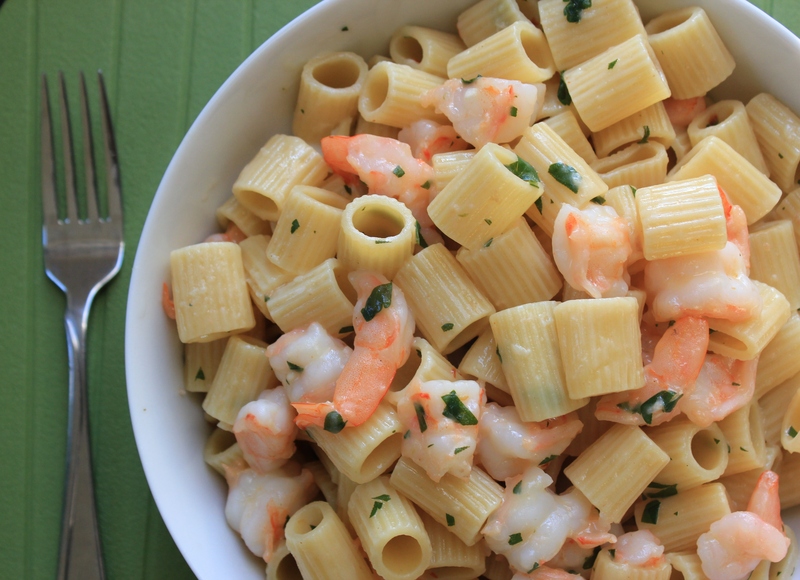 Garlic and shrimp and pasta – oh my! The sauce was so good that I actually wished I had used a little less pasta, as to have a better sauce to pasta ratio, so my only suggestion would be to maybe only use 3/4 lb of pasta (so not the entire box) but that’s just a personal preference. However, if you’re eating this with someone else, 2 cases of bad breath cancel each other right out!